The objects that surround us are a reflection of our priorities . Our priorities reflect our character . We reject disposability and believe that quality is more than a slogan. Perhaps we are an anachronism but we reject the idea of obsolescence, the idea that the life of an object is limited either by aesthetics or structural resilience. We are instead committed to a deeper interpretation of sustainability, one that emphasizes minimalism over excess, innovation in process and in design, and attentiveness to the consequences our production has on our community and the natural world. 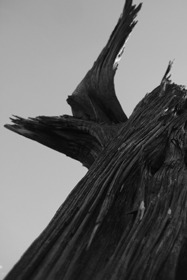 Our products are a distillation of the essential. They are a spare negotiation of beauty, utility and durability. With each object, we embark on a measured refinement to find its core, which is then expressed through a graceful coalescence of form, line, proportion and materiality. We seek perfect imperfection. By this we mean that we strive for the highest level of craftsmanship while embracing the subtle imperfections that imbue an object with character, particularly with regards to timber. To this, we add other natural materials such as metal, hardwood veneer, leather and stone, blending traditional techniques with innovative fabrication processes to balance machined precision with the maker’s hand. Based in the Piedmont region of North Carolina since 2001, our hope is that in creating pieces of such enduring value, we encourage others to examine their choices about the objects with which they surround themselves, and choose quality and durability over trends of fashion and disposability. Named one of the top 50 young designers of the Americas (Young Designers: Americas, Daab), Marks’ work has earned national and international recognition for its singular marriage of austerity, warmth and timelessness, and an uncompromising technical mastery that is accentuated by the use of natural materials like wood, leather, stone and metal. His approach is deeply rooted in the philosophy that argues for the inextricability of good design, extraordinary workmanship, and sustainability. 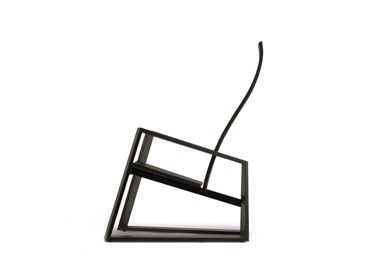 Distinguished for his organic, hand-shaped seating and spare, rectilinear casegoods and tables – unique in their negotiation of proportion, line and visual weight – Marks’ highly sought-after designs have been showcased in a range of residential and commercial spaces throughout the world. 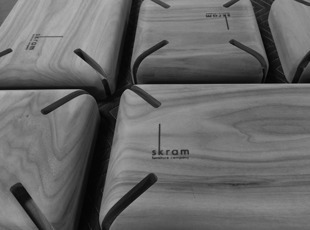 Skram products are made with a deep awareness of the impact our manufacturing has on our community and on our planet. We use only non-toxic adhesives and industrial strength, low-VOC water-based polyurethane finishes. Our timber is locally sourced as much as possible, and we are committed to broadening our offering of certified timber options as they become available in consistent quantity and quality. In 2008, we transitioned to a LEED contributing, formaldehyde-free, 100% pre-consumer recycled content substrate in our veneered products. (Link-to: website page with relevant information) In 2015, we installed a rooftop solar array at our Burlington, North Carolina facility. The resulting energy directly powers our machinery, while excess energy is fed back into the traditional power grid. We’re proud to say that this has lead to an annual offset of over 30,000 pounds of coal and over 50,000 pounds tof CO2. 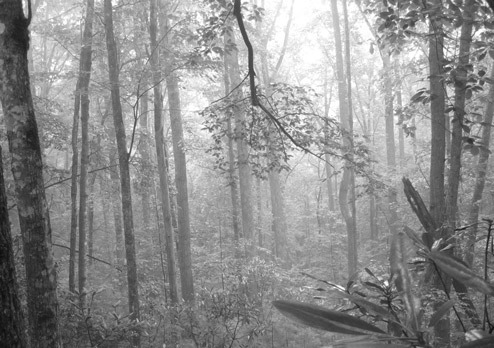 Skram is a member of American Forests, the Rainforest Alliance and the Sustainable Furnishings Council. Similar to Quickship, our rush order program permits accelerated lead times and guaranteed delivery dates for out-of-stock or customized items. Upcharges apply for this service and are calculated as a percentage of the invoiced amount relative to the required delivery date. We see our product lines as springboards for the creative vision of our clients. Each item can be customized in material, scale, and configuration beyond the standard options to suit a wide array of tastes, settings, and budgets. 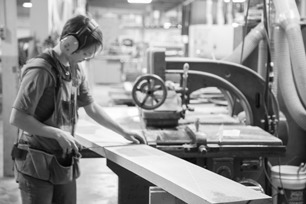 For firms or designers who specialize in unique, high profile, large-scale interior architectural projects, our Custom Contract division offers full-service bespoke design and fabrication. For inquiries regarding these projects, please email contract@skramfurniture.com.